Pieces of an ancient Egyptian necropolis which were pillaged from Egypt in 1999 have been discovered in an antiques shop in Spain. A Middle Eastern expert spotted the eight fragments of limestone after recognising the inscriptions, Barcelona police said. The pieces are inscribed with hieroglyphics dating from the 3rd Century BC. They will now be returned to the Egyptian government. 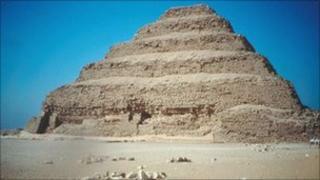 The artefacts were looted from the Saqqara burial ground in the ancient Egyptian capital of Memphis, south of Cairo, in 1999. A statement said they were found by an expert from the University of Barcelona who noticed that the pieces "bore inscriptions that made him suspect they came from" Saqqara. They had been on sale priced between 2,000 and 10,000 euros ($2,600; £1,700 and $13,000; £8,400).